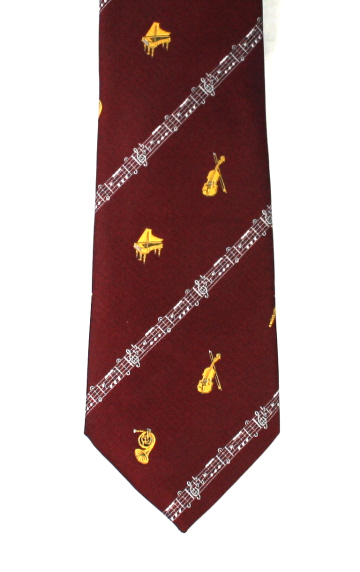 A selection of novelty hobby ties with various themes including music, cards and wine. If you are looking for a gift, don't forget our fun themed cufflinks and themed trouser braces. We have a variety of themed braces, cufflinks and tie clips for those with a particular passion. 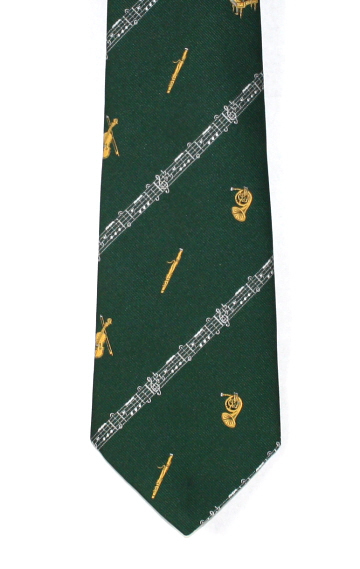 Smart music motifs on plain tie. Symbols include French Horn, Oboe, Violin and Piano. Themes available in three colours. An eye catching colourful guitar tie with various electric and acoustic guitars on a dark purple background. Made from pure silk. A themed red wine tie with bottles motif, glasses, barrels and that all important bottle opener! Great gift for those who love a tipple of the good stuff! A fun playing cards tie with large jokers, aces, hearts, diamonds, clubs and spades card motifs running the length of the necktie. Attractive embroidered hot air balloons in blue, yellow and white on a red silk tie.